As Web Project Managers we have all been in the meeting, taken the call or received that e-mail where the client is requesting a design or functionality direction that we just know is wrong, wrong for their business and wrong for publication on the web – but how are supposed to deal with this delicate situation? 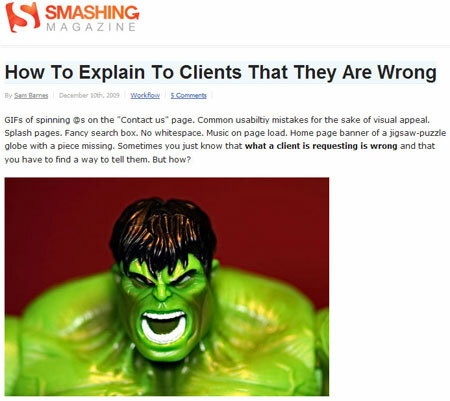 In my latest article published on Smashing Magazine I discuss a few approaches that can help when having to explain to a client they’re wrong. Stop waffling and take me to the full article! In the article I talk about first asking yourself if the client is in fact wrong, and if so, how you can talk to them in a language they understand so as to give yourself the best chance possible of making them understand your reasoning. I also discuss the advantages of establishing yourself as the web expert and highlighting any high-profile clients you’ve worked with, so as to increase your reputation and credibility with the client and thus your recommendations. Mentioned also is how backing up your recommendations with third-party evidence can sometimes be the edge you need when trying to convince a client to go with your suggestions. However sometimes a client just simply won’t listen to you and pretty much order you to do what they want. In cases like this the article advises to admit defeat gracefully and professionally, but not to let it necessarily be the end of the debate as there’s always a way to turn to defeat into victory that results in a win / win for both you and the client! great article Sam! That was one of the hardest topics to discuss in my last interview for me, you’ve definitely given me a lot of new responses. @Heffe, glad you like it, judging by the comments on the article it seems to be a subject many wanted to read about! It’s a great post. I especially agree with the opening gambit about the client might not be wrong. Unless I can prove that they are wrong, generally, I just like to discuss the issue with the client to find the common ground before saying anything aout them being wrong. I also agree with being direct and using with caution. I have a reputation for being very direct, however it has served me well more times than it has caused issues, as clients do appreciate honesty. Great post, and look forward to your next articles! Cheers Rob, I too have that reputation – sometimes it’s a blessing, other times it sure is a curse! But I do find it’s the best way to manage a client from the beginning given you have to work with them for a good few months at the very least. One of my next articles will be one you’ll recognise where the inspiration came from ;) I think you’ll do a giggle.